Kayli. Photo Courtesy of Woodstock Farm Sanctuary. In nature, the relatives of domesticated “cattle” roam the grasslands, deserts, scrublands and forests of every continent except Antarctica. The Bovidae family includes more than 140 species such as bison, antelope, gazelles, goats, and sheep. In many ways, these animals are symbolic of the wild and rugged qualities of nature. From season to season, their survival depends on intelligence, endurance, and keen senses. In the following segment, we use the term “cattle” to include both sexes at all life stages. Most domestic “cattle” can be traced back to a single common ancestor-the aurochs. Now extinct, the aurochs was native to the forests of southwest Asia. Although domestic “cattle” have been selectively bred for thousands of years, their basic anatomy, physiology and behavior are nearly identical to their ancient ancestor. As strict herbivores, they spend much of their time grazing in herds never more than a few miles from water. In an average day, “cattle” will drink 30 gallons of water and eat 100 pounds of plant material. Although plant material is dense with nutrients, it requires more time to digest. In order to maximize the nutritional value of this food, Bovids have evolved a four-chambered stomach. After initial chewing, the plant material ferments in the rumen and is then regurgitated, chewed a second time, and swallowed again. The ruminating process allows “cattle” to eat large quantities of food, and digest it later while lying hidden in the vegetation. They are crepuscular feeders eating primarily at sunrise and sunset. In addition to a specialized digestive system, Bovids have large, widely spaced eyes that allow for panoramic vision. They also have divided or ‘cloven’ hooves that are modified for endurance, while specialized horns enable them to defend themselves, their young and other members of the herd. In cold weather conditions, “cattle” will huddle together to share their body heat. In hot weather, they spend much of the day lying in the shade and ruminating. Historically, “cattle” have been revered by many cultures for their extremely gentle demeanor and maternal instincts. The bond between a mother and her calf is as strong as any in nature. Adults also form strong bonds as they spend many hours each day foraging, ruminating and grooming each other. Over time, the herd grows to include several generations of relatives, with the oldest members being more than 25 years old. “Cattle” have simple needs and modest desires. Like all animals, they strive to avoid pain, seek pleasure and fulfill their instincts. Males who are not selected for breeding are castrated and are called “steers.” To castrate the males, a knife or scalpel is used to cut the scrotum and the testicles are removed. In the process, the “steer” loses a significant amount of blood. The pain is excruciating, considering that the tissues contain numerous nerves and blood vessels, and anesthetics are considered an unnecessary expense. In addition to castration, the male’s horns are either cut or burned off, severing arterioles and venules in the process. The third act of mutilation is the branding. Using a mold of either red-hot or freezing metal, a number is burned into the animal’s skin causing acute pain. 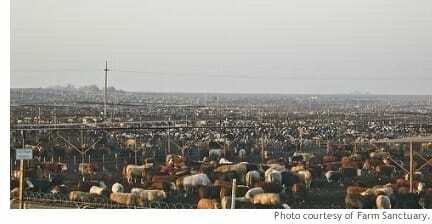 After several months of grazing, “cattle” are transferred to confined feedlots. The goal of the feedlot is to add significant weight in a short period of time. Some of the largest confined animal feeding operations (CAFOs) now house up to 100,000 “cattle” at a single location. Over the next 6-8 months, they eat a high protein grain-based feed, consisting of corn, soy, and miscellaneous by-products. Some of the by-products come from animal sources deemed unfit for human consumption. According to the latest FDA guidelines, “cattle” feed can include non-mammalian protein sources as well as chicken manure. Another factor that is largely ignored is that plant-based feed ingredients are treated with various agricultural chemicals, which ultimately accumulate in the “cattle’s” tissues. Because Bovids have stomachs that are highly specialized for breaking down grasses, the processed feed can cause a myriad of digestive complications. In addition to growth hormones, industrially farmed “cattle” are treated with antimicrobials (including antibiotics). The historical trend has been the increase use of antimicrobials on animals used in food production. From 2009-2015, there was a 24% increase in antimicrobials used on animals raised for food production with 34.4 million pounds of antimicrobials being sold in 2015 alone. In 2017, the Economist reported that, “a whopping 80% of all antibiotics sold go to farmers.” The drugs are administered for both therapeutic and non-therapeutic purposes. Therapeutic treatments are given in a preventative manner to keep the animal from becoming ill due to the increased presence of bacteria in their unnatural living conditions. Therapeutic antibiotics also help to keep the animal’s immune system artificially boosted as they experience unnatural levels of stress throughout their lives. Non-therapeutic treatments function in a similar manner to growth promoting hormones. As massive quantities of manure are dispersed as fertilizer, residues from the growth hormones and antibiotics leech from the manure and end up in local streams and lakes. The chemicals can have a devastating effect on freshwater ecology-especially fish and amphibians. 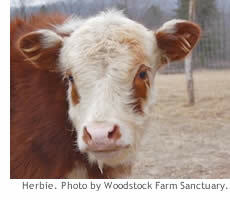 At 14-16 months old, the 1,200 pound “cattle” are rounded up and transported to a slaughterhouse. Considering that they are capable of living 25 years, these animals are essentially adolescents in an adult body. The process of transporting “cattle” from a feedlot to a slaughterhouse is extremely stressful. Like all animals, “cattle” have an innate fear of unfamiliar surroundings. Current laws allow transporters to travel up to 28 consecutive hours without a rest period. The 28-hour period can be extended to 36 hours by simply submitting a written request. During this time, the animals are deprived of food and water, and vomiting and diarrhea are common due to hours of vibration and maneuvering. 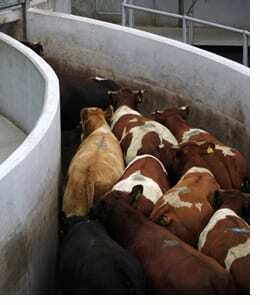 When they arrive at the slaughterhouse, they pass through a chute that starts out wide, then narrows. Each individual is placed in a “stunning box” designed to restrain the animal so he/she can be stunned. The goal is to penetrate the brain but not sever the brain stem. If the brain stem were severed, then the heart would stop pumping blood and the animal would not bleed out as quickly or completely as desired. The tool most commonly used for this procedure is a captive bolt pistol. The pistol is placed firmly against the animal’s forehead and fired. A pointed bolt penetrates the brain causing the animal to spasm uncontrollably, and then collapse. After being shackled by the hind legs and raised off the ground, the “cattle’s” throat is cut, and an incision is made from the neck to the abdomen. During the bleeding process many “cattle” regain some degree of consciousness. Workers must be cautious not to stand too close as the struggling animals flail their limbs. 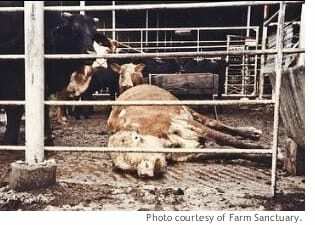 More than 34 million “cattle” are slaughtered each year in the United States. Throughout their lives, these gentle animals are subjected to conditions and procedures that are designed to manipulate their nature. They live in crowded, filthy feedlots as they are forced to eat an unnatural diet laden with growth hormones and antibiotics. Mutilations are commonplace, causing both acute and chronic pain. Unnatural confinement leaves them vulnerable to wildlife attacks and extreme weather. Having empathy for these animals is not enough-we must understand that these practices and conditions will continue to exist as long as there is a demand for their flesh. By going vegan, you can help put an end these cruel practices. Baskin, Y. 1997. THE WORK OF NATURE: HOW THE DIVERSITY OF LIFE SUSTAINS US. Island Press. Washington, DC: 165. Texas Natural Resource Conservation Commission: TNRCC Amendment to Permit to Dispose of Waste No. 01400, Livestock Investors, Inc. (September 29, 1995), Permit expanded from 70,000 to 100,000 head.